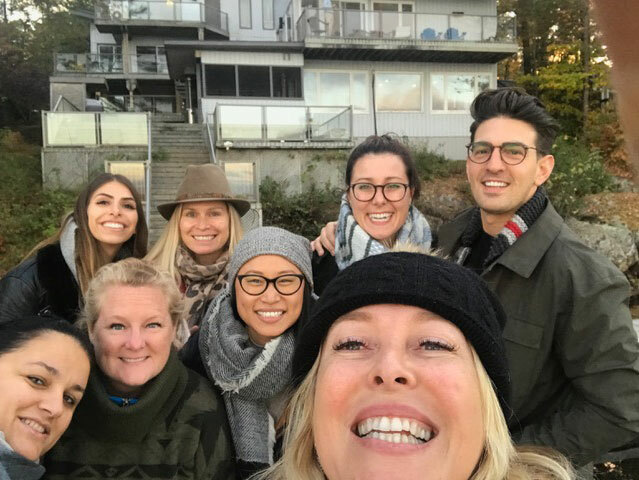 Retreats are a great way to jumpstart staff bonding around a purpose, like strategy planning or the beginning of a new fiscal year or a project. Yellow House hosts an annual team-learning retreat either in the spring or the fall. While we plan retreats for our clients, doing our own off-site gathering always reminds us why these sessions are invaluable. Retreats are a very interactive and hands-on way for businesses to reflect, learn, connect, refresh, refocus and review the past year and what is to come. Whether your budget allows for a flight to an exotic destination or a short drive for a day or two getaway, taking teams out of the office and into a new headspace has an incredibly powerful, lasting effect. We chose to stay relatively local for our 2018 Yellow House retreat — an overnight at a beautiful executive rental cottage about two hours outside of Toronto. We packed learning, nature walks, amazing meals with a private chef, campfire, cottage games, stargazing, dancing, pool sharking, “aha” moments and mic-dropping improv team presentations into our time together. Weekday retreats. Asking employees to give up weekends away from family is not a gift. They won’t resent one week-night away for a well-presented great experience, but more than two is too many. Definitely check in with staff before planning a multi-day out-of-country retreat. Be cognizant of the imposition that may place on personal and family obligations. Teambuilding should be done on paid time. Research is key. It often helps to bring in an outside facilitator, coach or content expert pre-retreat to interview or survey participants for discussion topics in advance and add value to what you provide on-site. Although your executive team may be able to provide excellent learnings, sometimes just one outside expert offers more gravitas. Also, allowing attendees some input into the agenda and content often leads to a more productive meeting. Be clear. People don’t like unknowns. Create and pre-distribute an agenda that reflects and reinforces the retreat’s goals and creates a comfort level around what to expect. In fact, share information on everything, from recommended attire, meals and activities to the tools they will need, what the accommodations will look like and how many breaks they will have to check emails or call home. Engage conversation. Build on the retreat’s goals by creating a participatory group environment and activities that encourage team interaction. For example, we circulated an anonymous, pre-event taking-our-temperature survey. We asked 10 key questions ranging from “If you were the CEO, what skills would you hire for next?” to “What do you see as the company’s best assets and biggest threats?” Having the survey answers in advance provided a great jumping off point for discussion, combined with exercises that made everyone feel comfortable, creative and constructive in providing feedback and ideas. Set ground rules. Start the meeting with a reminder to be thoughtful with feedback and never allow things to get personal. It is important to ensure everyone knows that the off-site meeting is a safe space where they can speak up and constructively challenge one another, and you, without fear of negative consequence. It is also helpful to start the session with a confidentiality reminder. Team-building vs competition. Plan activities that build teams rather than too many competitive exercises that pit them against each other. Some competition can be fun, but too much competition can have the adverse outcome a retreat is looking for. Ensure there is something for everyone instead of forcing people to do things they just aren’t into. Provide choices; don’t make everyone feel they have to do everything together to be team players. Allowing people to pair off by interest is a great way for them to connect and tell stories when you bring them all back together. Schedule follow-ups. The most common complaint about team-building retreats is that there is insufficient or no follow-up and most people forget what they learned or pledged to do differently within a week back in the office. This leads to failed goals and a retreat that wasted time and money. For example, I followed up on our retreat content with “Tips on T Days.” This was an email sent out weekly to all attendees on either a Tuesday or a Thursday with a reminder tip on something we learned on-site. The team loved this and it kept the content fresh while allowing us to wrap context around the learning with real-time work-related examples. Gift your guests. Whether you do it upon arrival or departure, remember company-branded gifts are “swag” not gifts. While swag is great, sometimes something unbranded and personal goes a long way. Make it fun. Go for an informal but structured itinerary, making it comfortable, inclusive, friendly and special. Always make the setting share-worthy to appeal to a millennial and social-media savvy audience. They want to share their experiences, beautiful settings and interesting insights. When you take people off-site, an airport hotel may not cut it. Give them an experience worthy of their time. Bringing staff together in an out-of-office setting and within in a timeframe that extends beyond 9-to-5 is a well-documented way to productively reconnect and refocus teams. Done well, team retreats don’t just provide a shared experience, but have lasting benefits both in and out of the office by building a stronger culture, better processes and new ideas.